Love Our Colleges - making the case for extra government funding to support fair pay and funding in further education. FE staff in England are getting a raw deal from their employers. Workloads have never been higher while average pay packets have shrunk and the latest kick in the teeth - the recommended 1% pay rise for 2017-18 - has not even been implemented in over 40% of colleges. And UCU has now described a pay offer for 2018-19 of just 1% from college representatives the Association of Colleges (AoC) as a 'wholly inadequate response' to the pay crisis in further education which has left teaching staff being paid £7,000 a year less than school teachers. UCU's Sean Vernell has argued that national pay bargaining mechanisms are failing the sector. Meanwhile the latest college accounts show 17 college principals earned over £200,000 in 2016/17 and over a third enjoyed a pay rise of 10% or more. 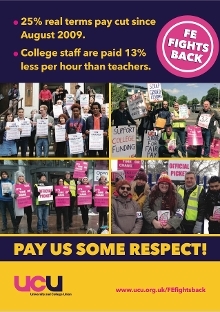 UCU's 'second wave' of campaigning for better pay and better jobs in FE means many branches are now taking up issues like pay, workload and job security directly with your college management. After they initially stated a refusal to enter negotiations over the pay claim, the Association of Colleges (AoC) has U-turned and confirmed that they will now receive the claim aimed at improving pay and conditions. We also have a selection of campaign posters for you to put up around your workplace. Bridgwater & Taunton college dispute settled after members voted to accept a deal that includes the end of graded lesson observations and a 2% pay rise over nine months (1% in April 2019 and another 1% in January 2020). Lower paid members will receive a 5% increase in April 2019. Pay dispute ends at London colleges after UCU members accept 'landmark' 5% deal. Strikes had been called off earlier in the year at the Capital City Colleges Group, involving City and Islington College, College of Haringey Enfield and North East London and Westminster Kingsway College, after a 'stepping stone' agreement was reached. The final landmark pay deal delivers 5% increase for over 1,700 staff at three London colleges. pay dispute at Lewisham and Southwark colleges is resolved with an agreed package of £350 pay rise and a commitment by NCG group to change the way strike pay is deducted. Staff had been offered only one pay increase (of just 1%) in five years. UCU and Sandwell College agree sector-leading pay deal. Strikes hit three West Midlands colleges: City of Wolverhampton College (8, 9 and 10 April), Warwickshire College Group (8 and 9 April) and Coventry College (9, 10 and 11 April) all walked out over pay. Post messages of support on social media using #FEFightsBack. Five colleges involved in strike action in March. On 20, 21 and 22 March: Bradford College, Croydon College, Harlow College, and South Bank College (formerly Lambeth) took action, and West Thames College members walked out on 18, 19 and 20 March. Abingdon and Whitney, Bath, Petroc and Wolverhampton colleges all suspended action due to progress in talks, while New College Swindon and Bridgwater & Taunton colleges members backed last minute deals. Members at 13 colleges took further strike action, though walkouts were suspended at two, Hugh Baird College and New College Swindon, after deals were agreed, and also at Coventry College to allow talks to continue. Members at the affected colleges walked out for two days in January 2019, with further days of action planned. Members at four colleges - Abingdon and Witney College, City of Wolverhampton College , West Thames College and Leicester College - were given a boost in their action after local MPs gave their support. New year strike threat at 16 English colleges in row over pay. UCU held a joint national lobby of parliament in Westminster on 17 October 2018, to make the case for extra government funding to support fair pay and funding in FE. Visit our Facebook event page for more details. MPs debate call for an urgent increase in college funding. The debate on 21 January 2019 arose after a petition launched by a group of Brockenhurst College students in October as part of the Love Our Colleges campaign reached nearly 70,000 signatures. Please sign the petition if you haven't done so already. Is a 1% pay rise all you're worth? Vice-chair of the further education committee (FEC), Sean Vernell, writes here in TES on why the fight for fair pay is also a fight for the well-being of students. UCU is also asking members in English colleges to take a few minutes to write to your MP asking them to support fair funding - especially after the Westminster budget produced so little. Please get in touch with your local UCU branch if you would like to get involved in campaigning for a better deal for staff. Once again Labour leader Jeremy Corbyn has leant his support to our campaign for a better deal for further education staff. As reported in the TES, Corbyn has called for funds to pay staff a decent wage and vowed to ensure the sector is not forgotten in terms of government funding. He also wrote to UCU members at Capital City College Group, congratulating them on a significant victory in winning better contracts for casual staff and a one off payment of £500 for all. 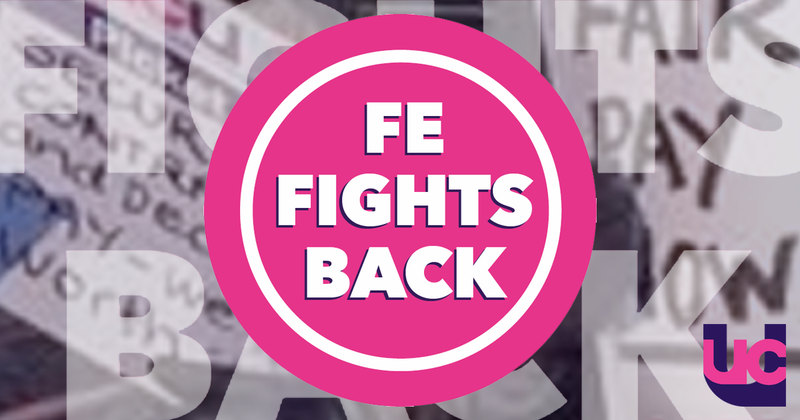 As part of UCU's FE fights back campaign, we are continuing to highlight the wider value of further education (FE). That's why UCU has jointly commissioned research on how FE can support social justice, educational access, and lifelong education with Education International, the global federation of teaching trade unions. Professor Leesa Wheelahan, Professor Gavin Moodie and Dr. Annette Ford, researchers at the University of Toronto in Canada are conducting this research for us. The same research will be conducted in four countries - Australia, Côte D'Ivoire, Taiwan as well as England. To help us make the case for FE, please fill in this short survey. If you would like to be interviewed as part of the research, please contact Professor Leesa Wheelahan.